What is the maximum draft for entering and leaving the Boat Lagoon Channel? What if my draft is over 3.2 meter? What are the maximum dimensions of yachts that you can work on? Will my yacht be in your factory or on the hardstand? Can you work at other locations than Boat Lagoon? How to maintain my yachts glossy new superior shine? What are the advantages of buying my yacht supplies in Thailand and not in Langkawi? Q - What is the maximum draft for entering and leaving the Boat Lagoon Channel? A - Up till now the maximum draught is 3.2 meter and you will enter and leave at spring tides (see our tide tables). For yachts with a deep keel, there is always a pilot boat that will guide you through the channel. Please, let us know when you plan to arrive, so all can be organized smoothly. Q - What if my draft is over 3.2 meter? A - Very soon you will be able to get into Boat Lagoon as well. We are developing a flotation system that is expected to reduce the draft of vessels up to 50 tons by up to 50 cm. For lighter boats the draft can even be reduced further by up to 80 cm. The first tests with the systems are expected in February-March 2012. Check with our team or on the Precision News page for any further developments. Q - What are the maximum dimensions of yachts that you can work on? A - The Boat Lagoon boat lift has a maximum capacity of 80 tons. The Precision factory in Boat Lagoon can host yachts up to 30 meters (99 ft) length and 13 meters wide. We also have a fully functional mobile work cover, that we can use both outside and inside the factory. The mobile cover is extendible for yachts over 30 meters. For yachts with sizes exceeding our factory and mobile cover dimension, we build custom-made work tents. Q - Will my yacht be in your factory or on the hardstand? A - In consultation with you we will create the best working conditions possible for working on your yacht for optimum results. Our main factory has extraction fans for dust and paint spray, and so has our carpentry workshop and the new mobile yacht cover. Wherever we work, we aim to keep a clean and safe working environment for your yacht and our staff. Q - Can you work at other locations than Boat Lagoon? A - Yes, we have done so on many occasions. For paint work and fiberglass work our team can organize to work at other locations. In Bangkok we painted the 53 meter MV Pegaso, in Hong Kong we have done paint work damage repair on yachts that were previously painted in our factory in Phuket and we resprayed Inspiration, a 82ft Azimut, at a shipyard in Phuket. Q - How to maintain my yachts glossy new superior shine? A - "It is the most asked question at East Marine Chandlery", says shop manager captain Peter Fowler, "but there is no easy answer as it largely depends on the combination of hull material and the application of special products. Make sure you ask us here at the chandlery first in order to avoid disappointment. Once you start applying the wrong products or techniques it is quite difficult, or costly, to undo the consequences." Here some tips from Peter to start you off. Depending on whether you have a GRP yacht or a painted yacht and even depending on the type of painted top-coat, different approaches and products do apply. Peter Fowler: " We are happy to give personal advice on the best way to maintain your boat and give her that stunning shine back". For more information, visit the East Marine Chandlery in Phuket Boat Lagoon; call +66 81 0823 113; email: info@eastmarineasia.com ; or visit the website: www.eastmarineasia.com. 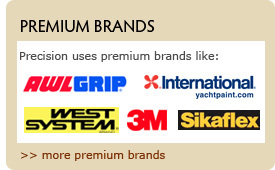 Q - What are the advantages of buying my yacht supplies in Thailand and not in Langkawi? A - Yachts often consider to buy their marine items from Langkawi, due to tax benefits. When entering Thailand however, purchased items need to be imported legally through customs. Illegally importing items has many risks, and can cause problems with the warranties on the items.